James Jabara was born in Muskogee, Oklahoma, October 10, 1923. He was of Lebanese American descent and his parents came from Marjayoun, Lebanon. He graduated from Wichita High School North in Wichita, Kansas, in May of 1942, and immediately enlisted as an Aviation Cadet at Fort Riley, Kansas. After attending four flying schools in Texas, he received his pilot's wings and a commission as Second Lieutenant in October, 1943, at Moore Field, Texas. During World War II, Jabara flew two tours of combat duty in Europe as a P-51 pilot, the first with the 363rd Fighter Group of the Ninth Air Force from January to October, 1944, and the second as a P-51 pilot with the 355th Group of the Eighth Air Force from February to December, 1945. During his European combat, he flew 108 combat missions and was credited with the destruction of one and a half enemy planes in aerial combat and four on the ground. After World War II, Colonel Jabara attended the Tactical Air School at Tyndall Air Force Base, Florida, and from 1947 to 1949 was stationed on Okinawa with the 53rd Fighter Group. Colonel Jabara returned to the United States and his last duty assignment before going to Japan was at the New Castle (Delaware) County Airport, where he was Flight Commander. Jabara arrived in Japan December 13, 1950, and was assigned to the Fourth Fighter Interceptor Wing, a unit of the Fifth Air Force. By January 2, 1951, he had flown five combat missions in F-86 Sabrejets and had damaged one MiG-15 enemy jet fighter in air combat. His first confirmed "kill" was April 3, 1951. He scored another April 10, a third April 12, a fourth April 22 and his fifth and sixth May 20, making him the first American jet ace in history. All his victories were against MiG-15 jets. Colonel Jabara returned to the United States in May, 1951, for temporary assignment to Air Force Headquarters, Washington, D.C. and two months later was transferred to the Air Training Command at Scott Air Force Base, Illinois. Upon his request, he returned for another tour of duty overseas, arriving in Korea in January 1953. On his second tour, he shot down nine more MiGs for a total of 15. He returned to the United States in July 1953 and was assigned to Headquarters of the 32nd Air Division, Syracuse, New York. He then assumed command of the 337th Fighter Interceptor Squadron, Westover Air Force Base, Massachusetts. Colonel Jabara died in a car accident in Florida on November 17, 1966, just as he was preparing for his first tour in the Vietnam War. 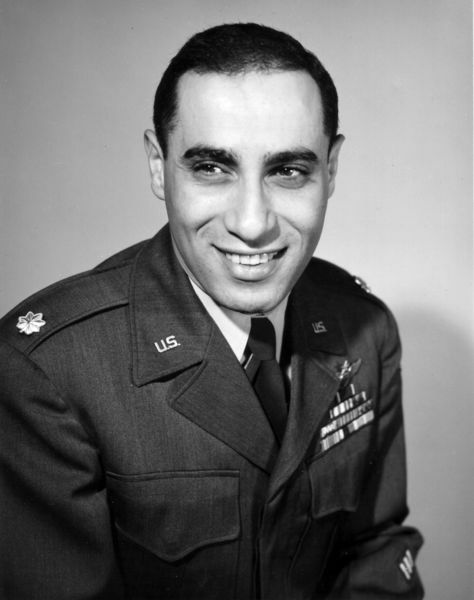 The world's first jet-vs-jet ace was James Jabara of the U.S. Air Force who scored his initial victory on April 3rd, 1951 and his 5th and 6th victories on May 20. He was then ordered back to the U.S. for special duty. However, at his own request, he returned to Korea in January 1953. On November 17, 1966 the Jabara family, James, Nina, James Jr., Carol Anne, Jeanne and Cathy, was driving on Florida's Sunshine State Parkway near Delray Beach on the way to a new home in South Carolina where wife and children would wait out Jimmy's planned combat tour of Viet Nam. Jabara was by then the youngest Colonel in the Air Force, was widely rumored to be on the brink of promotion to General. Carol Anne, sixteen years old, was driving a Volkswagen with her father as a passenger, while behind came Nina and the other children. Going through a construction zone, Carol Anne lost control of the car and it rolled several times. James Jabara was pronounced dead on arrival at the Delray hospital and Carol died two days later. The two were buried together in a single grave in Arlington National Cemetery. 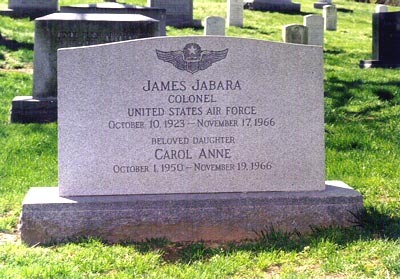 WASHINGTON, November 22, 1966 - Air Force Colonel James Jabara, America's first jet ace, and his 16-year-old daughter Carol, were buried today near President Kennedy's grave in Arlington National Cemetery. Several hundred friends, including some of his fellow aces of the Korean War, attended the double funeral ceremony. Colonel Jabara, 43, and his daughterdied after and auto accident on the Florida Turnpike on November 17.